Do you think twice before smiling or even speaking because of your crooked, crowded, or gapped teeth? Dr. Stansbury can help you get that perfectly straight smile you’ve always wanted, and he won’t need traditional metal braces to do it! Our orthodontic options are fantastic for adults who need to maintain their daily appearance while getting beautiful results. To learn more about how we can straighten your teeth today, give us a call. Why Choose Stansbury Dental for Orthodontics? 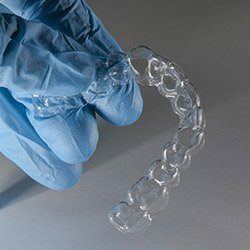 Invisalign® completely does away with metal brackets and wires, instead using a series of custom-made clear plastic aligners to gently shift the teeth in the most discreet way possible. The aligners are practically invisible when worn on the teeth, and whenever it’s time to eat or brush, a patient can simply take them out. In fact, Invisalign® has been shown to deliver final results in just 12-18 months in most cases, which is just a fraction of the time compared to regular orthodontics. If you’re looking to only straighten the teeth that show when you speak or smile, then Six Month Smiles® is the fastest way to do it. This treatment focuses on shifting just the front six teeth, which causes them to move much faster compared to regular orthodontics without needing additional force. Six Month Smiles® also uses clear brackets and tooth-colored wires to create a very subtle appearance. Plus, as the name indicates, treatment times are often less than a year.